Schleich was founded in 1935 and is one of the largest toy manufacturers in Germany, and is an international leading supplier of figures. The famous figures and games from Schleich are sold in more than 50 countries and can be found in children’s rooms around the world. Sofia is very creative and good at design; Blossom loves to be looked after by her while Blossom's owner Anna is away. You can learn more about Sofia and Blossom and their friends in The Horse Club. This is a good way to encourage children to create stories around the horse and their riders, using the prompts given. In harmony with her name, Blossom has delicately painted purple flowers woven into her mane and tail - it's these little touches with Schleich toys that are such a delight, as there is always plenty to spot and enjoy. These horse and rider sets are great individually, but the scope for imaginative play is vastly increased by owning several in the set - and that makes an excellent gift idea! Each rider has their own individual characters - Sarah is sharp and perceptive and loves to write, often about magic. Perhaps your child could be encouraged by this to write their own stories or perhaps poems about Sarah and Mystery? As with all Schleich figures, these are incredibly detailed - even the underside of the hooves are embossed with horseshoes, and each rider has a delicate horseshoe bracelet. This attention to detail is an excellent learning curve for children, as they see how much is added to quality by paying close attention to the little things. All Schleich figurines are durable and will withstand plenty of handling without showing signs of wear. We also received the Schleich 42118 "Blanket and Headstall Figurine Accessories which can be used with any of the horses. A well-made product in an attractive tartan, plus plastic headstall. Hannah and Cayenne are the adventurous ones. Hannah, with her bright red hair, looks high spirited. As always, these models are hand-painted; again, to an exceptional standard, which really brings out the detail. With each of the horses in the set, the saddle, blanket (each horse has their own colour) and reins can be removed - this really helps with imaginative and role play, as children can carefully bed the horses down for the night, with the help of their riders - and hopefully by using some of the other excellent Horse Club sets such as the horse stable and riding school. These are a really good way to extend play value and the opportunities are almost limitless as all the sets are compatible. Lisa is always ready to try something new, and is very sporty. Each rider is articulated (the arms, knees and legs can be moved), adding to the play value and scope for imagination. The reins and stirrups are of flexible plastic, making them easy to manouvere - and to ensure the correct riding position! The horses and riders are recommended for ages 5 to 12, and are not suitable for under threes. There's lots more fun to be had by looking at The Horse Club website and by signing up to join There is also a great website www.horseclub.com where children can have lots of fun and find out lots more information to enhance their enjoyment. These four horse and rider sets are super and will be very popular with children, who will enjoy the opportunities for imaginative play; I think they can also be used to stimulate creative writing. The high quality of the models means they look great displayed too. As with all Schleich products, it's the high quality manufacture that immediately strikes me as I unpack the box. The weight of each individual creature is testament to this - they are really sturdy and stand up reliably, which is so important to avoid frustration when children are setting up scenes. This set consists of a dinosaur cave and the ingenious part, that will fascinate children, is that the front part of the cave can be transformed into a catapult when the stone column is moved - cleverly done and a really good addition to the play value of the set. Move the stone slab and it buries everything under it. 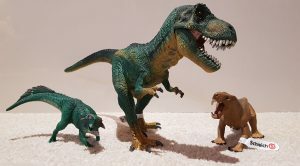 The set (which is recommended for children of 5+) includes a large Herrerasaurus (with a moveable lower jaw for added realism) and a Microraptor and a Psittacosaurus; we like the fact these are slightly less common and so less likely to be in a child's current collection. 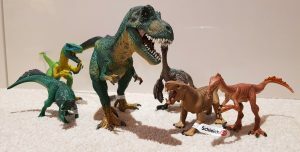 Of course, children may well have other dinos from the extensive Schleich range (and if not, this set will make them want more! ), and existing collections will have their play and imaginative value vastly enhanced by this set. There's also a dino skull, again with moveable jaw. Pictorial instructions are included for assembling the cave - it's very simple! All of the Schleich figurines and playsets are designed with superb attention to detail and painted by hand; they are made to last too, and the superb quality means they always stay looking good. They are remarkable for their accuracy and parents can be assured that their children are playing with really accurate models, so learning about these fascinating creatures. 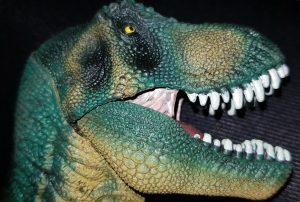 The Dinosaurs range from Schleich encourages children to explore the fascination of the prehistoric era and its creatures through educational play. The Dinosaur Cave can be purchased from www.schleich-s.co.uk One of the things we love about Schleich is the way that every new addition enhances the play value of existing toys in a child's collection, and this dinosaur cave is no exception. They also look great left out on display. Another superbly made toy that will be loved by children - and adding more dinos to their existing collection is a great gift idea! We are big fans of Schleich animal figurines in this house, and especially the dinosaurs as they are all so different and interesting. 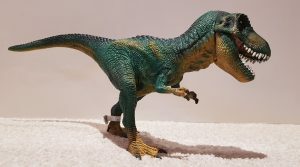 Parents in Touch have reviewed three of the new Schleich dinosaurs for 2018; Dinogorgon, Psittacosaurus and a large version of Schleich's top-selling Tyrannosaurus Rex. Each dinosaur has a small booklet attached to it giving information about the time period it lived in, how long it was, how much it weighed and what type it was (e.g. carnivore). A relatively small and short dinosaur which is thought to have been around two metres long and from South Africa. The Dinogorgon figurine is brown with dark brown stripes across its back, it has large fangs, a strong jaw and a tail. The name means 'Parrot Lizard' and you can see why when you look at this dinosaurs face, it has a beak-like mouth and no teeth. It is believed to have come from regions such as China and Russia. The Psittacosaurus figurine is green and bumpy with light pink feather detailing around the face and tail. One of the most popular and well known dinosaurs, this large species could reach 12-13 metres long and was found in Western North America. 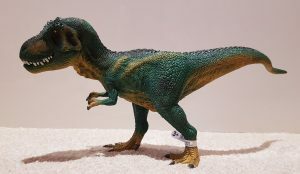 The Schleich Tyrannosaurus figurine is around 30cm long and almost 15cm high, it is fantastically detailed all over, even the bottom of its feet! 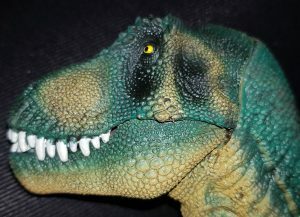 The T-Rex also has a movable jaw so he looks extra scary! 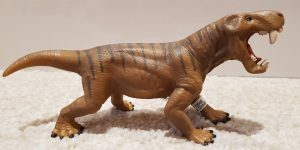 The paintwork on all of the models is of the extremely high quality that you would expect from Schleich and each one is painted by hand, the detail that each dinosaur has makes them incredibly realistic. Your child will be able to explore the fascination of the prehistoric era through play while learning something new, and with the new Jurassic World: Fallen Kingdom film out on June 6th 2018 they will be able to re-create scenes and create their own scenarios. 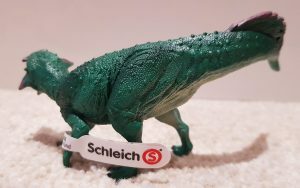 The Schleich dinosaur figurines are aimed at ages 5+ and you can see the whole range here from Schleich. Schleich are continually bringing out new models. This is great as there is always something new for children to look out for. This detailed model even includes accurate feathering. Every new animal refreshes the collection and adds to play value - and there are always present ideas to hand! These dinosaur models are really educational too, as children can learn facts such as 'The Oviraptor lived over about 75 million years ago at the time of the Velociraptor.' Linking informatiom with the model really helps children to memorise and also to put the creatures into historical context. All the models can be purchased from Schleich at www.schleich-s.co.uk. This dinosaur was a new one for me and I learnt that the tawa was a carnivorous dinosaur with a slender snout and long neck; great to see children being introduced to some new creatures. The textured detaik on the model is excellent, with subtle colour gradations which work well. Paramount to Schleich's philosophy is accuracy and attention to detail. This is so important and it's good to know that children will be playing with (and therefore learning about) really accurate models... as far as modern discoveries allow. As with each of these dinoaurs, a little informative leaflet is attached to the model - keep these to build up a little reference collection. The recommended age for these dinosaurs is 3+. This was one of the smallest dinosaurs at just 70cm high, making a pleasing contrast to the others. Like all Schleich models, this is hand-painted with great attention to detail and plenty of textured effects. This model features moving front legs - this is a great feature as it encourages children to play even more imaginatively; it's a feature I would love to see on more of the models to enhance play value. The opening jaw is definitely ferocious, with its rows of fearsome teeth and moulded tongue - children will love this feature! The models are sturdy and well made, with a really solid feel, not flimsy at all. Evn the smallest parts are durable and strong. 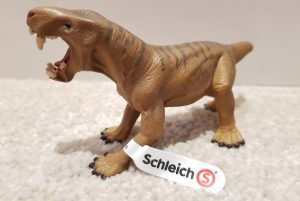 The Schleich website is a fantastic resource for finding out more about these dinosaurs, including fun facts, so do encourage your child to do some research and enhance their experience. The exceptional quality means the figures are great to keep on permanent display. How about encouraging your child to do some research into the kind of world where these dinosaurs lived, and to make a model on which to display them? Just as with all Schleich products, this is a detailed and totally accurate model which ensures children know exactly how the animal looks. The intricate paintwork captures the nuances of the coat and even the tiniest detail is included. After birth, lion babies have a sand-coloured fur coat with dark, circular spots and they are well camouflaged in the savannah. They spend their first four to six weeks in a den and at three months, they are strong enough to follow their mother wherever she goes. The Panthera leo's home is Africa and Asia, where they live in Hot Desert, Subtropical Forest, Subtropical Grassland, Subtropical Shrubland and Dry Savanna. Buy from the Schleich website. This majestic looking beast with isi wrinkled skin looks imposing and fearsome, but he is in fact a peaceful creature who grazes on vegetation. He is beautifully made, with superb texturing on his skin which makes him really life-like. The Schleich website is full of information about all the animals, so do make use of this and encourage your children to learn more about the creatures they are playing with. I have given some samples of this in some of these reviews. Finding out information will develop children's learning skills and interest in the animals. Why not encourage them to find out the creature's habitat and draw a scene to show the details? Buy from the Schleich website. Symbolic of Spain, this imposing bull can be used in a variety of play scenarios. They can weigh well over 1,000 kg and are extremely strong. Before a bull attacks, it displays warning behaviours. It shows itself from the side so that it looks bigger, tosses its head back and forth, scrapes the ground with its front hoof and bellows - fearsome! All the Schleich animals can be used as part of their impressive play stes, or played with as part of individual collections. Once your child has started to build up their collection, you will never be at a loss for a gift to buy! And the great thing is, as soon as you add one or two creatures, the play value of the whole set is enhanced. Children will learn, from the various groups, just who lives with who in real life - and will make up their own eclectc groupings too! Buy from Schleich. This adorable little pony is ideal for using with farm playsets, or for all young horse and pony fans who want to build up a collection of really accurate models - the careful use of distinguishing features means all the models are true to life. The white mane on the dark brown horse is very effective, with lovely realistic detailing; it's a lovely chunky model which stands well for play fun. Collect the animals together to make themed displays for a child's room and encourage them to learn about habitats. You only need to pick up these high-quality models to feel what sets them way above others. They are really heavy for their size, and feel so solid. Ours have been enjoyed for many hours of play, and the paint never shows any signs of wear; they are so durable. Schleich are continually adding to their collections, as well as bringing out new play worlds, so there's always something new to look out for to keep children's interest high. Find the Shetland Pony gelding on the Schleich website, and learn more about these creatures, who can be found over the world. This is a fantastic toy, with so many different activities to stimulate children's imaginations. The Croco Research Station is situated in the jungle. Go on a wild adventure. Set off on a research mission in the jungle and discover rare species and look after injured animals whilst enjoying the many play functions and exciting features. There is so much in this toy - the CROCO skull, which comes with opening and closing removable jaws and a secret hiding place in his tooth (children will love this! ), the jungle research building complete with viewing platform; there's a trap door, hoist container with net, 11 pieces of clip together fencing (two designs), crystal skull, treasure map and many more accessories including plenty of scientific equipment, - far too many to list, but I promise you, they are all accurate and highly detailed. Secret passages lead to the treasure chamber for exploring fun. Inhabiting this world are a ranger figure, a crocodile, an orang-utan, a black panther, an Asian elephant calf I promise you, your child will have lots of fun emptying the box and discovering the contents. The generous size means it's perfect for 2 or more children to play with together, encouraging interaction, sharing and the development of co-operative play skills; children's imaginations will also feed off one another, adding to play value. Like all Schleich products, the attention to detail is impressive, and children will learn exactly what the animals are like with these accurate models. Everything is beautifully made, with huge attention to detail. Of course, children can mix and match with the other products in the range, extending play value even further. A wonderful present, and one that will give many happy hours of imaginative play. You can buy direct from Schleich here, and browse their whole fabulous range on the website. Schleich toys are a superb way to encourage children to take an interest n and to discover the world around them. The Croco Jungle is a really impressive toy and children will find it stimulating and creative, as they act out their own scenarios. This is a super new addition to the already extensive Schleich Horse Club range, and really extends the play value of children's existing collections, including Horse Club and Farm Life. The Mobile Vet's Van comes complete with Hanoverian Foal, with bridle and leading rein so it can be carefully looked after by the vet. The van lid lifts for easy access and play. In addition, there are loads of other accessories, including a medicine box, heap of apples, a laptop, table and stool, Xray machine and screen, ramp and stickers... plus the vet, of course (this is poseable). Schleich are well known for their high manufacturing standards and their great attention to detail, which ensure that all their models are really true to life for exceptional play value. All Schleich model animals and accessories are beautifully hand painted making them lovely to play with as well as great collectable items for the equestrian enthusiast. All Schleich models comply completely with relevant safety regulations and are CE tested and approved. Tidy-minded parents will like the fact that everything can be put away into the van after use, ensuring that it's easy to keep the set all together - it can be so frustrating when little pieces get lost. The educational advantages of the set include developing hand-eye coordination, stimulating imaginative play and developing role play scenarios - I am sure you can think of more! Another winner from Schleich and one that children will be really keen to add to their collection. See the whole Horse World collection here. Buy direct from Schleich. The Schleich Farm World collection just keeps getting bigger and better, giving children lots of opportunities for imaginative play as they build up their collection - they are great ideas for presents, as every time a new set is added, the play value of existing sets is increased and refreshed. And as Schleich models are so well made, they will last and last without showing any signs of wear. Schleich's attention to detail is well-known - for example, the tractor can drive through the gate of the farm set and under the silo, making the sets perfectly interchangeable. The tractor doors can be opened so the farmer can climb in and out, and the windscreen and windows are made of safe transparent, break-resistant plastic. Even the mirrors are real! The tractor has moving wheels which glide well on a hard surface. As always, the pieces are really true to life, so children will be stimulated to enjoy imaginative play with the trailer, working front loader, baby animal and hay bale - plenty to load and unload! There are even stickers for more play value. The hand painting is done with great attention to detail, which makes the models so realistic. See the whole Farm World collection here. Buy direct from Schleich. I am a big fan of Scheich products - their attention to detail is remarkable and the accurate representations of animals make them an excellent way for children to learn exactly what animals look like; once children have played with these high quality animals, nothing else will match up. These elegant and graceful Pintabian horses are new to the Scheiich range, and they are a lovely addition. Pictured alongside is the Pintabian mare, and there are other horses and accessories in the range - a Pintabian Foal, Pintabian Stallion and Foal Care Accessories which includes a horse brush, curry comb and bottle (reviews of these will follow shortly). Just like the real horses, these figures have unique, beautiful coat patterns which make them unmistakable. As with all Schleich figures, these are carefully hand-painted hand-painted with detailed modelling; I love the silver of the horseshoes and the colour even extends to underneath the horse's hoof. We were also sent a cute set of accessories for the horse - this included a blanket, feeding bottle, brushes - and even a pile of apples. All great to extend the play value and to encourage imaginative play. As your child's collection of Scheiich animals grows, so too will their imaginative play, inspired by the high quality which makes play a joy; the animals can also be combined with other toys for even greater play value; they look great displayed on a shelf or windowsill too. You can see the full collection on the Schleich website. For even more enjoyment, sign up for the Horse Club for exclusive monthly competitions and content - perfect for young horse lovers.